Adjusting a binding garage door is rarely needed when the door is installed properly. This is not a common problem, more likely you need to see the articles on 'Garage Door Track', this adjustment is not hard. Or the article on 'Adjusting Garage Doors' may cover your issue. When the trim board is installed too close to the door it can bind. This binding will usually occur when the door is almost closed. The track on can be adjusted away from the frame with one exception. 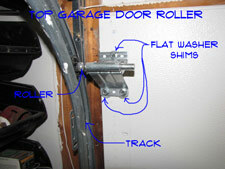 The clip assembly that holds the top garage door roller in place is not adjustable. The bolt holes in the track are not slotted. Operating your door manually would allow you to give it and extra push right at the end. It works, but not ideal. With a garage door opener, the motor may not have the strength to push the door down all the way. Watch the door as it closes and see if it is binding at the end. Is there a gap at the floor when the door is closed? Can you pull the door down manually to eliminate the gap. Try to see if the door is bound at the very top. With the door up, examine the trim. Is it sticking in past the framing for the door? 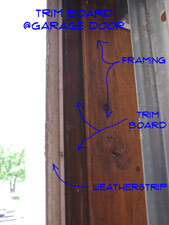 The trim board should be flush or slightly behind the framing. It should not be further inside the garage than the framing. You have two choices at this point. The first is to chisel off the excess wood until the trim board is flush with the framing lumber. This spot is concealed most of the time and if you use a sharp chisel you can do a neat job. The other options would be to shim the top bracket to pull it away from the framing. This will only work if the distance is minimal, say one or two flat washers thick. Loosen the top clip and slip a flat washer between the metal plate and the door. Put one washer behind each of the three or four bolts holding the roller assembly in place. Check the door and see if this helped. I would not go beyond two washers to solve the problem this way. More than that and you need to chisel away the excess trim board. Work with the trim board until the door closes freely. Were you successful at adjusting a binding garage door? Yes, well that is good news. You're done.